Super Pitfall, as it was originally released in 1986-87, was a disaster of monumental proportions. While it had a great game concept, that concept was buried under a pile of flaws a mile high: Bland, ugly graphics, ear-bleeding repetitive music, and design decisions that will drive you insane. And that was on top of the game being a buggy, unpolished mess. Thirty years later, NESRocks has released a patch that claims to fix a lot of the problems that made the original such a lost cause. Does it succeed? Not only does it succeed, it does so beyond my wildest dreams. The game is now actually fun to play. When I played the original Super Pitfall, I felt depressed afterwards because I knew that under all of those flaws was a good game trying to get out. Unfortunately, it is quite clear that the programmer of the original game, Micronics, couldn’t make the NES look good if their lives depended on it. This patch makes several fixes to the game that make it much more fun to play. First of all, all items are always visible, meaning that you no longer have to jump around to find a hot spot to make them appear. Warps have been given the same treatment. Now, instead of jumping into a random wall or condor (which looks exactly like the ones that kill you), there are doors that you simply walk up to. These two improvements on their own are a godsend, but NESRocks has also taken the time to fix a lot of the bugs that made the game a pain to play. I never fell off a ladder when climbing, which was a common occurrence in the original. There are still some graphical issues, but they never caused me a problem while playing. In the original game, you had to constantly be on the hunt for additional bullets for your gun. In this version, the gun has unlimited ammo, but you don’t start with it. It’s pretty close to the beginning though, so it’s not a problem. After constantly being out of bullets in the original game, this is a welcome change. The game now saves your progress, which is quite helpful, as you no longer need to worry about the continue code. This does lead to an interesting change. When you lose a life, you start close to where you died, like in the original game. However, when you game over, you now re-spawn from the starting point of whatever map you were on. Even though this can be very frustrating, it still feels fair, balancing the game so that you can’t just breeze through it. Replacing the score and bullets counter is an inventory shown at the bottom of the screen. This new display shows all of the items currently in your possession, from keys to quest items, to how many gold bars you have found. This is very helpful. Last but not least, there are now options on the main menu to go to a screen that shows your objectives and current progress, as well as a Music Test. If you are familiar with the original, you might wonder why on earth anyone would use that, but hold that thought for now. All in all, these major and minor changes make the game much more playable and even, dare I say, good. 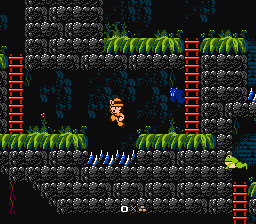 There is one point in the level design that reminds me of that death trap at the beginning of the original game (which has been fixed), where dropping off a ladder causes you to fall into a lava pit, but besides that, the game is now almost infinitely more playable. The moment you boot up the game, you are treated to a gorgeous new title screen that really shows off the major improvements made in the graphical department. The game is now colorful, vibrant, and quite charming to look at. A large percentage of the sprites and background tiles have been completely redrawn, to much improvement. 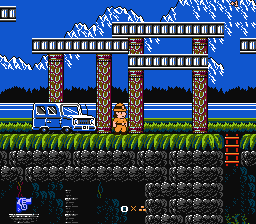 The original game looked like a very early and primitive game for the NES, which in all fairness, it was. The new graphics are a huge upgrade, taking full advantage of the system’s capabilities and make the game look like a much later release. Of special note are the new sprites for Pitfall Harry, Rhonda, and Quickclaw the lion, all of which have been completely redesigned. Harry no longer resembles Mario. His new design is cute, charming, and far more appealing. He also now points the gun in the right direction. Rhonda and Quickclaw have been redrawn to resemble their counterparts from the Saturday Supercade cartoon, which is quite a clever nod, as that was where the characters first appeared. Finally, in a very nice touch, there is now an actual ending graphic! No more black screen with text! Good riddance! All in all, I couldn’t imagine the game looking better. One of the most striking facelifts I’ve seen in gaming. 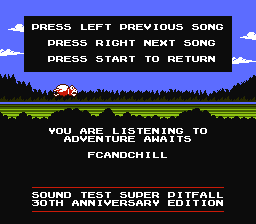 The original soundtrack for Super Pitfall was jaw-droppingly bad. The main theme was an irritating 15 second loop, and the other songs weren’t much better. The new soundtrack isn’t perfect, but my god, what an improvement. All of the songs have been replaced. 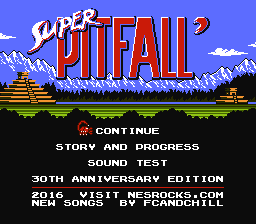 The new main theme is a nice remix of the Pitfall II: Lost Caverns theme, which is appropriate, as Super Pitfall is basically a remake of that game. The song also lasts slightly over a minute now, which goes a long way to making the experience more enjoyable. The balloon theme has been upgraded, but is otherwise the same song. The warp area and Dark World themes are brand new, and both are well composed and appropriate. The warp area theme is a calmer, more laid back tune, and the Dark World theme is suitably spooky. While not one of the best soundtracks on the system (to be fair, it has formidable competition), it is quite serviceable and does the game far more credit than the original. You might actually feel like using the Music Test! Speaking of which, the old soundtrack is still in the game, and is available for listening in the Music Test, if only to show what an improvement the new music is in comparison. Talk about the devil being in the details! 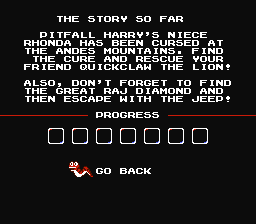 Super Pitfall: 30th Anniversary Edition is such an improvement on the original game that it indisputably proves Micronics to be a total laughingstock. If this was the version that had been released thirty years ago, the game would likely be considered a classic today. Is it perfect? Not at all, but this patch took an abysmal game, and made it into a fun, enjoyable experience that shouldn’t be missed. Download this. Do it now. You won’t be sorry.